How Can a Living Trust Help Me Prepare for the Future? When it comes to planning for the end of our lives, we often don’t like to think about it. However, failing to plan could mean leaving a mess behind for your loved ones to handle once you are gone, and most of us don’t want that either. Having a will is one option to help prepare for what will happen to your assets when you die, but a living trust is another option to consider. This is a document, or trust agreement, that you create to manage your assets during your life, but distribute the remaining assets to others after your death. The person creating the trust is called the grantor, and the person responsible for managing the trust assets is named the trustee. 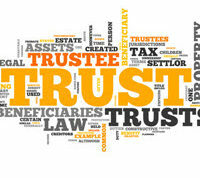 You may serve as the trustee yourself, or appoint another person, company, or bank to serve as the trustee. The trust is labeled revocable because you may terminate it or modify it during your lifetime as long as you are not incapacitated. During your lifetime, your trustee will manage the trust property and invest your money as outlined. Upon your death, the trustee will be responsible for paying all taxes and claims as well as distributing any assets to your beneficiaries as outlined in the agreement. To get the full benefit of a trust, you will need to formally transfer all your assets including real estate, investments, and bank accounts to the trust before your death. Alternatively, you can designate certain financial accounts to be “payable on death” to the trust. Assets that aren’t transferred may be subject to probate. While Florida uses the Uniform Probate Code to simplify the probate process, there are still advantages to having a living trust in Florida. Spare your family the delays and expense of probate court proceedings. If you become incapacitated, your appointed trustee is authorized to manage your trust by paying bills, making investment decisions, and managing your assets. This may avoid the need for a court-appointed guardian. A living trust helps provide for your loved ones by naming the beneficiaries of your assets before you become incapacitated or die. You have a great deal of flexibility with a trust because you can terminate it or change terms at any time. Because your estate will not need to go through the probate process, there is often much less conflict over an estate because a trust can speed up property distribution. It is recommended that you still have a will, even if you have a living trust. A will can provide backup plans for your assets that you fail to put into your trust. For example, if you buy new property, but die in an accident before adding it to your trust, that property may go through the probate process before being added to the trust’s assets. This type of will is called a “pour over will”. Creating and executing a trust can be a complex and confusing process. Even though the trust will eventually make your life easier, creating it can be difficult. Laws in Florida that dictate trusts are also complex and change frequently. Rather than attempting it on your own, it is best to contact an experienced attorney who knows the laws and can guide you in creating a living trust for you. David Toback has been helping Tampa clients form trusts for nearly two decades. Contact him today to get your trust document created and get your end of life affairs in order.